Gluten is Under Attack: Ceasefire! The G word is almost as bad as the F word these days. In recent years, gluten has been getting a bad rap due to the mass media, celebrities who are so-called gluten experts and books such as Wheat Belly and Grain Brain. For those who don’t know, gluten is a protein found in grains such as wheat, barley and rye. The media has jumped on the gluten-free bandwagon. Why? Because fad diets such as this are sensational so they get media coverage. On the other hand, eating a healthy diet is not sensational so the media doesn’t pay attention. The media needs to learn to think critically. Celebrities are also to blame. They claim to be gluten experts. And as I’ve said before, people believe celebrities for some reason. If Oprah says it, it must be true, right? But celebrities are not experts on gluten, organic food, GMOs etc. Who are the experts? Researchers, scientists and farmers. I could go on and on critiquing the Wheat Belly and Grain Brain books but I’ll just make a few points in this blog post. Please remember that these authors don’t do their own research. They mine other research and then pick and choose the research that fits their thinking. And most of the recommendations in these books are largely based on testimonial rather than scientific evidence. Random Jane Doe says gluten is eating my brain so it must be true. Well, what about the science? What does the science say? If you’re going to read these books I encourage you to read them with a critical mind and remember that marketing is playing a role – the authors are jumping on a popular bandwagon and trying to sell books. Do they have your best interests at heart? We don’t know for sure. I’ve wanted to tackle this subject for awhile now because I know so many people who are anti-gluten for one reason – they’re trying to lose weight. And they believe that by removing gluten from their diet they will lose weight. And they’re right – they probably will. BUT, it’s important to remember that weight loss from the removal of wheat in the diet is caused by the removal of so many foods from the diet not just gluten. Being overweight or obese is not caused by one food component. Something else to consider: many populations have consumed a wheat-based diet for centuries without weight gain. Sugar-free, fat-free – basically any product that has free attached to the label must be good for me, right? So gluten-free must be better for me, in the eyes of the unknowing consumer. Not true. And unfortunately many large companies and venues have caved to the gluten-free pressure and slapped the label on various products – some of which don’t even contain gluten in the first place. This just creates more confusion for the consumer. Here’s an example. I attended a conference recently at a large popular venue in a major Canadian city. Every meal – breakfast, lunch and dinner – was served buffet style. And every item at every meal had a gluten-free label on it, including food such as bacon and potatoes, which would never contain gluten anyway (unless you’re eating those fake potatoes from a box). I acknowledge that there are people who suffer from Celiac disease – a genetic disorder that affects between one and two percent of people in the world. In fact, several years ago, I was misdiagnosed with Celiac disease so I completely understand this. I also realize that an estimated six percent of people in the world suffer from non Celiac gluten sensitivity. And these people need to follow a gluten-free diet. But the problem is self diagnosis. People self diagnosis themselves with Celiac disease or non Celiac gluten sensitivity based on popular media. And this can have adverse health effects, including high fat, high sodium and low fibre. Gluten-free does not equal healthy. I repeat: gluten-free does not equal healthy. Eating whole grains is part of a healthy, balanced diet. I encourage everyone to eat a balanced diet that includes food from all food groups: whole grains, fruits and vegetables, dairy and meats. And everything in moderation. Watch your serving size – it’s about portion control. Of course, to be healthy you also have to exercise regularly, get enough sleep and monitor your stress level. I recently had the opportunity to learn more about the Healthy Grains Institute, which was established as a not-for-profit in 2012 to inform and educate Canadians on the health benefits of whole grains. And if you think the HGI is going to feed you false information about gluten just to get you to eat it, please keep in mind that it is guided by an independent scientific advisory council. I encourage you to visit their website for great information, facts, resources on healthy grains. A field of wheat on the Canadian Prairies. 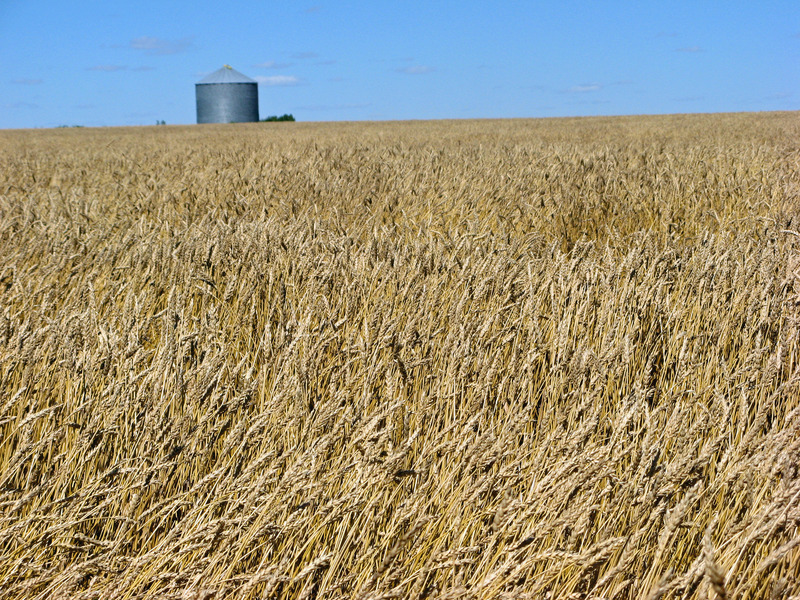 Here’s a fun fact for you: 240 million hectares – this is the global land mass where wheat is grown. This is the largest of any crop worldwide. Wheat, which contains gluten, is feeding a hungry world. You may have the luxury of walking through your large Canadian or American grocery store with shelves stocked full of choices – gluten-free, GMO-free, organic, all natural – so you can be choosey and reject gluten and all those other “bad” things, but there are many, many people in the world who don’t have that luxury. Grains, containing gluten, are providing them with nutrition. Gluten is not a bad word. Stop the attack on gluten. I liked your post and “liked it”. So much truth. When it comes to food, farmers have no idea… sorry to burst bubble girls, farmers are the backbone of the world but they grow what monsanto tells them to grow, my whole family are farmers. I’d take the word of a cardiologist with 30 years working experience, or world renowned neurologist, you know the ones that you mentioned above. If you don’t like what they are saying look at the Institute of Functional Medicine, the best of the best when it comes to food and whats there take on gluten. Last study I saw up to 44% of people have a gluten sensitivity, with 1% of the actually having celiacs. If you know you don’t have an issue with gluten go ahead and eat some, but still keep it down as even whole grains will spike your blood sugar, leading to insulin resistance, and diabetes when consumed to much. I’d also be cautious with “experts” at Healthy Grains Institute, a place funded by grain growers, with some of the experts working on government panels for grain growers…. Thank you for reading and commenting, Tracy. I respect your opinion however I disagree. The farmers I know, know food because they’re growing it. No farmers, no food. If you don’t have Celiac disease or a gluten sensitivity, there’s nothing wrong with eating some whole grains. But everything in moderation. Eat a balanced diet, as I say in my blog post. Finally in regards to the Healthy Grains Institute, you’re right, they are supported by grain grower associations. Of course these kinds of associations are going to support them. But they’re also supported by other groups/companies and looking to expand their members into other areas. Hey Teresa! It’s Heather Mundt. We used to know each other from the Medicine Hat News. Thanks for leveling the scales of information. It’s all I’ve heard lately from some of my relatives is how they are going gluten-free because it has all these supposed negative health effects. I have kept enjoying my usual diet and often wonder if there is any truth to all the things they say about gluten. This encourages me to keep a critical mind about what I’m hearing and who I’m hearing it from. By the way – have you done any research/writing on GMO’s? Those I am more concerned about than gluten. I agree that there is currently a lot of consumer confusion around gluten due to the marketing hype. Thank you for reading and commenting. Thank you. I’m happy to hear someone calling out the hype. I own a bakery, and have seen the hysteria and hatred grow over the past few years. I don’t question people who have physical issues when they consume certain foods, but what are those foods? Mass produced “whole grain bread” is often made with sugars/corn syrup and LOTS of yeast to speed the fermentation process, which will naturally create a food product that is inherently difficult to digest. But in the meantime, I wish people and the media would relax and stop spreading the message that gluten is the source of most if not all humanly ills. Again, I respect those with Celiac Disease and those with measurable medical issues. But in my experience, it seems quite faddish and exaggerated. You make some good points. Thank you for reading and commenting!